Satire is a fun thing to play with in photography. It’s something I think about all the time. My image, shot for today’s Daily Photo Game play’s with this notion on a couple of levels. 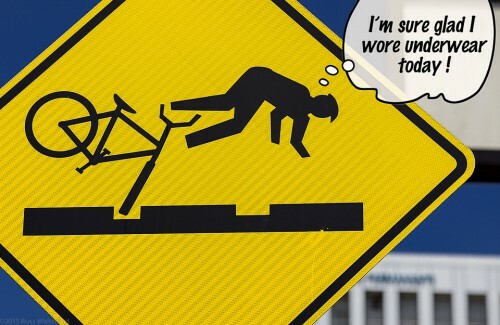 Our new streetcar in Portland has these cycling “warning” signs along the line, when I first saw them I thought it was a joke (those crazy Portlandia’ns). The implications struck me as ironic, that is to say something that is supposed to be healthy – bike riding – might nearly kill you. The sign is so explicit, it is hard to believe it's real. I was reminded of these road signs as I mulled on Robert’s bicycle image “The Joker” and the lightbulb went off. At first I was content with my image straight out of the camera, however, upon closer inspection of the image, I noticed the corse dot pattern used to print the sign. Another flash of inspiration… that dot pattern, the strong primary colors and ironic subject reminded me of Roy Lichtenstein’s work. My Lichtenstein treatment of the photograph adds yet another layer – a type layer that is – to the original image, taking the piece in a more satirical direction. What struck me in the pairing of these two images was another implied message, that in playing this photograph, I became the joker as well. Please like, comment and share by clicking below, thanks.